Blevins' research group studies macro/micronutrient concentrations in leaves of tall fescue during fall, winter, and spring. Leaf concentrations of phloem mobile elements drop during late fall and winter and this may indicate that they are being re-mobilized. One objective of the research is to determine if remobilized macronutrients are stored in roots over winter, and another specific objective is to determine if the plant is storing nitrogen during winter in the form of vegetative storage proteins. In another project, plants with a certain C4 photosynthetic pathways are being tested for their responses to manganese nutritional levels. C4 plants that use Mn-activated NAD-malic enzyme to release CO2 in bundle sheath cells may require 25X more Mn than other C4 plants and all C3 plants. Lenis JM, Ellersieck M, Blevins DG, Sleper DA, Nguyen HT, Dunn D, Lee JD, and Shannon JG. Differences in Ion Accumulation and Salt Tolerance among Glycine Accessions. Journal of Agronomy and Crop Science 2011;197(4):302-310. Kering MK, Lukaszewska K and Blevins DG. 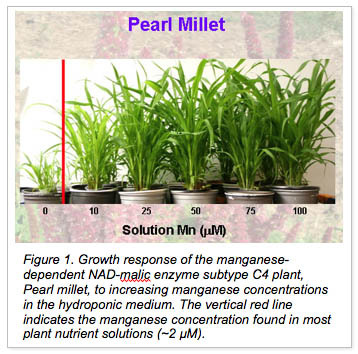 Manganese requirement for optimum photosynthesis and growth in NAD-malic enzyme C-4 species. Plant and Soil 2009;316(1-2):217-226. Stacey MG, Patel A, McClain WE, Mathieu M, Remley M, Rogers EE, Gassmann W, Blevins DG and Stacey G. The arabidopsis AtOPT3 protein functions in metal homeostasis and movement of iron to developing seeds. 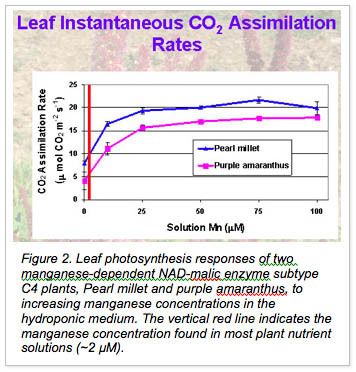 Plant Physiology 2008;146(2):589-601. Todd CD, Tipton PA, Blevins DG, Piedras P, Pineda M and Polacco JC. 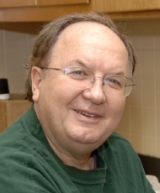 Update on ureide degradation in legumes. Journal of Experimental Botany 2006;57(1):5-12. Reinbott TM, Conley SP and Blevins DG. No-tillage corn and grain sorghum response to cover crop and nitrogen fertilization. Agronomy Journal 2004;96(4):1158-1163. Bolanos L, Lukaszewski K, Bonilla I and Blevins D. Why boron? Plant Physiology and Biochemistry 2004;42(11):907-912. Waters BM, Blevins DG and Eide DJ. Characterization of FRO1, a pea ferric-chelate reductase involved in root iron acquisition. Plant Physiology 2002;129(1):85-94. Lock TR, Kallenbach RL, Blevins DG, Reinbott TM and Bishop-Hurley GJ. Adequate soil phosphorus decreases the grass tetany potential of tall fescue pasture. Crop Management 2002;8. Smith GJ, Wiebold WJ, Niblack TL, Scharf PC and Blevins DG. Macronutrient concentrations of soybean infected with soybean cyst nematode. Plant and Soil 2001;235(1):21-26. Waters BM and Blevins DG. Ethylene production, cluster root formation, and localization of iron(III) reducing capacity in Fe deficient squash roots. Plant and Soil 2000;225(1-2):21-31.